Aid to statistics: Are we doing it right? A true partnership builds on the strengths of lively interaction between its members. This first Web-Newsletter of PARIS21 aims to facilitate and encourage the exchange of ideas and information within our diverse partnership of producers and users of statistics. With the facelift of our website, and our growing presence on social media platforms, we now reach an increasingly expanding audience of multilateral organisations and individuals in countries all over the world. On the horizon for 2013 are key topics such as the Post 2015 Development Framework, exchanges on how to best utilise big and more openly available data for development, and examinations of the emergence of institutional innovations linked to the production and dissemination of statistics. From our prospective as Secretariat, our main challenge this year is operationalising last year's Board decision for us to act as Secretariat for the Busan Action Plan for Statistics. Working in conjunction with our Task Team, we have advanced considerably and now have an excellent road map. We aim for this road map to be endorsed at our next Board meeting from 9 to 11 April 2013, and supported with the necessary funding. As you browse through our first newsletter, and click through our re-launched website, we encourage you to share your initial impressions of the content and presentation of these new communication tools. Your perspective on how to best use social media and this newsletter to strengthen and build our partnership is valuable. Please share with us your comments, feedback and ideas for developing the tools further. Just drop us a line at via our online contact form . In conjunction with the launch of the first Web-Newsletter of PARIS21 Secretariat, we are also building stronger connections with the statistical community by expanding and improving upon our online presence. Our newly designed website provides quick access to a wealth of the most up to date information about statistical development around the world and in developing countries. Do you want to know more about how statistics are being used in a specific country or region? Are you trying to promote a better use of statistics and want PARIS21 to help with advocacy efforts? Are you searching for reports and publications related to the status of statistical development? Simply log in to our newly designed website, where you can access the latest information on the Partnership's activities and upcoming events, and enjoy free access to our rich online statistical library and other statistical resources. In addition, PARIS21 is now present on social media. Become a fan of PARIS21 on Facebook and follow us on Twitter for instant access to updates on statistical development, news from our network around the world, commentaries from experts, statistical analysis, and opportunities for statisticians. Our Vimeo Channel provides advocacy video materials on the importance of statistics. Statistical systems in many poor countries are undoubtedly weak. This is how the panelists of a PARIS21 debate on Big Data described the situation in developing countries. While user demand for data is increasing exponentially, national statistical offices often encounter difficulties providing timely and accurate information. Could Big Data serve as an alternative or supplement to official data in developing countries? What are the opportunities and the risks? How can official statistical systems cope with the current revolution in the flow of information? These are some of the questions tackled during the PARIS21 debate "From data poverty to data deluge? 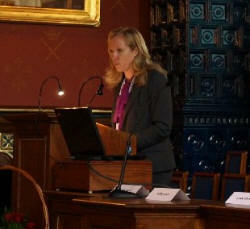 Statistical systems and evidence based policy making", which took place on the 21st of January 2013 in Paris, France. Organised in collaboration with the Development Assistance Committee of the OECD, the debate brought together over 100 participants including statisticians, economists, and development specialists. During the debate, participants highlighted the potential role of Big Data for development. Big Data could be used for early warning systems, for example mining tweets to assess rainfall patterns or Google searches to detect spikes in illnesses. In many OECD countries, Big Data is already being used to produce price statistics and national accounts. While Big Data holds great promise, there was also a general consensus that it should be seen as complementary to, and not an alternative for, official statistics. Despite the numerous problems that official data production faces in developing countries, the latter, unlike much of Big Data, provide more accurate, reliable, readable and accessible information which complies with international statistical standards. Participants stressed the need to make use of emerging modern technologies to strengthen the quality of official data and the role National Statistical Offices could play in quality control of the current data flow. Looking ahead, participants placed an emphasis on the urgent need to include statistical capacity development in the agenda of the Post 2015 Development Framework. Speaking at the debate, Mr. Johannes Jutting, Manager of the PARIS21 Secretariat, said: "It is unfortunate that only less than 1% of Official Development Assistance goes to statistical capacity building. Statisticians need to be part of the Post 2015 discussions. One of the weakest points of the current MDGs is the lack of official data at the national level, which is the only way to measure progress and achieve results in a sustainable manner". Over forty African countries are currently designing or implementing a National Strategy for the Development of Statistics (NSDS). PARIS21 has recently facilitated a number of activities in Niger, Benin, Burundi, and Guinea to support these countries in their NSDS processes. We place special emphasis on the user-producer dialogue, the co-ordination of stakeholders and funding mechanisms, which remain one of the main challenges for national statistical systems. In Niamey, Niger, a workshop held from 9 to 11 October brought together users and producers of statistics to exchange views on the achievements of Niger's first NSDS (2008-2012). Workshop participants issued recommendations for the design and the content of the second NSDS (2013-2017). Participants stressed the need to improve financing mechanisms, dialogue with external partners, overall co-ordination of the national statistical system, the quality of statistics and data dissemination. Meanwhile, Benin launched its second NSDS during a workshop held in Cotonou, from 2 to 4 October 2012. The progress of the country's NSDS (2008-2011) was reviewed and assessed by users and producers of statistics. Participants also issued crucial recommendations for the Government. First, to consider statistics as a priority area and secure funding through the design of Medium-Term Expenditure Frameworks (MTEF), while recognising their importance in the design and monitoring/evaluation of development strategies. Secondly, to include funding for statistical activities among protected expenditures. Following these recommendations, the PARIS21 Secretariat is currently supporting Benin in the creation of a National Fund for the Development of Statistics and proposes a concrete mechanism for funding statistical development (including a donor group on statistics). In October 2012, a mid-term review of Burundi's NSDS was undertaken in collaboration with AFRISTAT and the UN Economic Commission for Africa (UNECA) to evaluate the progress made by the Burundian statistical system over the first two years of the 2010-14 NSDS. The results show that the NSDS has conferred a stronger visibility to the production and dissemination of data, widened the spectrum of partners mobilised around statistics, promoted co-ordination between line ministries and the central statistical office and instituted a monitoring process for the strategy. But the review also underlined that the mobilisation of adequate resources by the government remains a major constraint. The results of this evaluation, and its recommendations, have been presented to the National Statistical Council and will be used as a powerful advocacy tool. Following the recommendations of the Abidjan Regional Seminar held in September 2012, PARIS21 is currently assisting the National Statistical Institute of Guinea with organising a user-producer workshop on 31 January 2013. This workshop will bring together managers from both the national statistical system and the Poverty Reduction Strategy Unit, with an aim to adapt the NSDS action plan to the specific data needs of Guinea's Poverty Reduction Strategy. PARIS21 will facilitate this event and will promote south-south exchanges by inviting the NSO of Cote d'Ivoire to share its experience on mainstreaming statistics into policy documents. The role of statistics in the regional integration process has grown in recent years. Some sub-regional organisations have designed Regional Strategies for the Development of Statistics (RSDS), targeted at strengthening statistical harmonisation and developing common frameworks for statistical production and processes to support policymaking. To support such efforts, in 2012, Eurostat and PARIS21 helped regional bodies in Central America and South East Asia develop and promote their RSDSs. Eurostat and PARIS21 organised a regional event in San Salvador from 5 to 6 November 2012, in co-ordination with the Central America Statistical Commission (CENTROESTAD) of the System of Integration of Central America (SICA). The event's 60 participants discussed assessment results and main orientations of their RSDS. This is part of the participatory process for the design of the regional strategy, initiated by SICA-CENTROESTAD and supported by PARIS21 and various partners. During his opening speech, the Executive Director of SICA, Don Edgar Chamorro, underlined the importance of statistics: "Central America needs harmonised, comparable and reliable information in order to monitor integration processes." Three weeks later, a regional workshop on Strategic Statistical Planning took place in Jakarta on the 28th and 29th of November 2012, to promote the strengthening of the regional statistical system of the Association of South-East Asian Nations (ASEAN). Co-organised by the ASEAN Secretariat, Eurostat, and PARIS21, the event gathered some 60 participants who agreed on a number of recommendations to support policymaking, the sustainability of the RSDS, and the strengthening of the ASEAN Statistics Unit (ASEANstats). While delivering a keynote address on the role of statistics in facilitating the way forward to ASEAN regional integration, H.E. Mr. Ouk Chay, the Cambodian Secretary of State in the Ministry of Planning, commented that statistics are "an important tool in translating strategic goals into concrete, manageable, and measurable actions." In collaboration with the Philippine National Statistical Coordination Board (NSCB), the PARIS21 Secretariat organised a national workshop on Statistics and Inclusive Growth in Manila on 5 December, 2012. The workshop was the first of its kind where data users as well as official and non-official data producers were brought together to discuss the new data environment required by "inclusive growth" policies. Considered one of the hottest issues in the Philippines nowadays, the achievement of inclusive growth requires a broad range of disaggregated data that would allow decision-makers to identify, implement and monitor adequate appropriate policies to sustain inclusive prosperity in the country. Participants issued a number of recommendations on how to improve existing mechanisms in the Philippines for enhancing the production of statistics required for inclusive growth policies. These recommendations include actions at the sub-national level (where priorities often differ from the ones set at the national level), and call for an increased partnership between official and non-official data producers. The International Household Survey Network (IHSN) has just launched its Central Survey Catalog which provides users with a searchable listing of surveys and censuses conducted in low and middle-income countries. To date, the catalog provides detailed metadata on 1,600 surveys, 1,250,000 variables, 8,000 citations, and many more to come! Looking for microdata on food consumption in a selection of countries? Just type it in and the catalog will return a list of surveys and variables, with the corresponding access conditions set by national producers. This catalog is maintained by the IHSN Secretariat, in collaboration with the World Bank and a large number of national and international agencies. It does not provide access to microdata, but when available, provides a link to external catalogs where the data can be obtained. It builds on joint efforts from a number of statistical producers around the world engaged in enhancing the use and re-use of survey data, to promote evidence-based policies and better development outcomes. These efforts are being supported by the PARIS21/World Bank Accelerated Data Program. The PARIS21 Secretariat recently published results from the 2012 round of its Partner Report on Support to Statistics (PRESS). In its fifth edition, the PRESS exercise reveals positive findings but also some disquieting ones. Is statistical support increasing or decreasing? Is it fairly distributed across countries/regions? Are donors truly committed to statistical development? ... Insight into the 2012 PRESS Round. 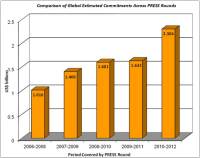 Financial commitments to statistical development for the period 2010-12 amounted to roughly US$ 2.3 billion. Although these figures are up considerably from previous PRESS rounds, as illustrated in the figure to the left, support to statistical development still represents only about one-fourth of one percent of all Official Development Assistance. Between 2008 and 2011, the regional distribution of commitments to statistics had shifted steadily away from the largest recipient, Africa, with Asia-Pacific being the primary beneficiary of this change. However, the 2012 round saw a slight correction back toward the African continent. Africa's 2012 share rose from 41% to 46%, equivalent to US$ 1.056 billion in commitments. While the increase in commitments to statistics is certainly encouraging, worrying signs of unbalanced distribution of that support persist. Commitments are in fact heavily concentrated in a small number of countries. The 2012 PRESS exercise captured support to 111 countries; however, a mere 15 combined to equal 40% of total estimated commitments (i.e., including unallocated support) and 54% of total country-specific commitments (i.e., excluding unallocated support). The alignment of development programmes with country priorities is another area where improvements are needed, as a decreasing percentage of aid is now aligned with national statistical strategies. Forty percent of projects/programmes were confirmed as being aligned with National Strategies for the Development of Statistics (NSDS), down from 52% in the 2011 PRESS Round, yet81% of low and lower-middle income countries have an NSDS process already in place. Judging by PRESS figures, can we conclude that the international community is supporting statistics appropriately? Although the overall volume of support has increased, there remains room for significant improvements in aid delivery. A small concentration of "aid darlings" dominate the scene. SIDS, in particular, could greatly benefit from providers of development co-operation diversifying the countries on the receiving end of their support. (It is interesting to note that, of the bottom 50 countries in the PRESS list of aid recipients, the PARIS21 Secretariat is working with nearly half). Furthermore, more developing countries should explicitly express their needs for support through an NSDS, and development co-operation providers can do a better job in aligning their support with those strategies. "We should think of new ways to ensure that users' needs are being heard"
Ms. Frances Harper was recently appointed chair of the PARIS21 Executive Committee. In this interview, she speaks about progress in statistical development, key challenges, and the role PARIS21 can play in bringing statistical users and producers together. Frances Harper is a Senior Statistics Adviser at the UK's Department for International Development (DFID). She has been with the Department for 14 years, working on a range of issues including: corporate monitoring; statistical capacity building in Southern Africa, Nepal and Bangladesh; aid effectiveness; and results. Frances spent two years on secondment to PARIS21 and is now head of DFID's Global Statistics Partnerships Team, responsible for DFID's multilateral statistics programmes including those with the World Bank, UN Statistics Division, PARIS21 and the International Monetary Fund (IMF). Prior to joining DFID, Frances worked for the Scottish Government and spent two years as a volunteer teacher in Zimbabwe. In September 2012, she was appointed Chair of the PARIS21 Executive Committee. You have more than a decade of experience working for the UK's Department for International Development (DFID), specifically on statistical capacity building in developing countries. What's your assessment of the current status of National Strategies for the Development of Statistics (NSDS) in developing countries? What progress has been made? NSDSs are a hugely important tool in strengthening statistical capacity. We have seen NSDS processes lead to increased country ownership, and clearer prioritisation of needs. They have also helped increase donor coordination - allowing us to align more clearly behind countries' own requirements, and made it less acceptable for us to do the kind of un-strategic and ad-hoc work that doesn't always build sustainable capacity. As we know, progress in designing NSDSs has been impressive (with now only two IDA borrower countries not having, or not planning to develop one). And what are the main challenges facing developing countries today? The real challenge is implementation, and we need much more progress here. I would like to see more support to produce clearly prioritised and costed implementation plans. And I would like to see all donors who are active in statistics get behind these plans. Activities outside of NSDS (particularly data collection activities) should be the exception, and countries should say no to donors who do not align with their own priorities. Another key challenge is broadening NSDSs to cover the whole statistical system, and linking effectively across sectors. The revised NSDS guidelines PARIS21 are developing, and the Global Strategy for Agricultural Statistics (which is providing support to integrate agriculture into NSDSs) will help. But perhaps a more concerted effort is needed here to ensure all key elements of a country's statistical system are improved (including less 'high profile' areas such as national accounts, vital registration systems etc.). And finally on this, I wonder if we could do more to enhance user engagement on NSDSs? Their input is particularly crucial in the design phase, but remains important throughout. Perhaps we - as a global statistics community - could think of new ways to ensure all user needs are being heard, and being met by NSDSs. As the newly elected chair of the PARIS21 Executive Committee, what is your vision for the partnership at large? Firstly, it is an honour to have been elected chair of the Executive Committee, and I look forward to getting started in the role. I believe the PARIS21 Partnership has a crucial part to play in global statistical development and in driving up the quality, availability and use of statistics. In terms of where I would like to see the Partnership.... I would like more donors involved (including key bilaterals like the US, important multilaterals like UNESCO, as well as emerging donors like the Arab countries and private foundations). I would also like to see even more engagement with users. I think we statisticians should spend less time talking to each other, and much more time talking to our users. And I mean users in the broadest sense - government policymakers, parliamentarians, researchers, media, civil society, and citizens themselves. If we can increase our understanding of their needs and get a much clearer sense of the different demands for statistics, we could more effectively deliver those needs and in turn increase that demand (that well-known idea of a virtuous circle: more demand, more funding, more use, more demand and so on). "Statisticians should spend less time talking to each other, and much more time talking to our users "
What kind of role should the Secretariat play in implementing the Busan Action Plan for Statistics? The Busan Action Plan for Statistics is a huge opportunity to do just that, and I think the PARIS21 Secretariat can play a crucial role in its implementation. It has already made a good start: having consulted country and donor partners on their priorities; convened a Busan Task Team; and begun to set out the way forward. It will be important to build on this work and to outline - in really concrete terms - what needs to be done under each of the five Busan objectives. To remind ourselves what we agreed at Busan, identify what is already being delivered, set out where the gaps are, and agree how we will fill those gaps. And it will be important to increase the momentum of this work. The Busan High Level Forum on Aid Effectiveness was over a year ago, so we need to up the pace and start delivering. I see the Secretariat at the center of this delivery: coordinating activities, tracking progress, and holding us all to account for what we have agreed. What is PARIS21's competitive advantage in supporting statistical development globally and in developing countries? For me, the key strengths of the Partnership are the fact that it brings together both developing and developed country statisticians, as well as both producers and users of statistics. It is probably the only forum designed to make this happen systematically, and that is a huge advantage we need to capitalise on. Its relative neutrality is also important. What kind of activities would you like to see strengthened in a rapidly changing environment for data production, dissemination and analysis? "We need to do more on user engagement, and more to get data used"
As I mentioned, I think we can do more on user engagement. I'm sure we would all like statistics and statisticians being more closely involved in policy processes, including for example the current debate on the Post 2015 framework. Some ways we could do this might be: by building wider networks (and let's be ambitious and think of high profile, influential champions for statistics); increasing our profile (including through social media perhaps); increasing our own capacity to participate in policy discussions and make statistics relevant (we should probably admit that we are not always great at communicating to non-statisticians). We could also do more to get data used. Including by making existing data more available and more accessible (and we have seen an excellent example of this through the Kenya Open Data Initiative), and by building technical skills so that data can be analysed in country, not just in donor capitals. Two High-level Meetings on the Improvement of Civil Registration and Vital Statistics (CRVS) took place in South Africa (3-5 September 2012) and Thailand (10-11 December 2012). The meetings aimed to improve CRVS in both continents and reviewed the political, institutional and resource challenges facing member States in improving their CRVS systems. - What is open data and how is it used? - What kind of data should be included? - What are the technical and legal requirements? - What are the benefits of open data -- and the costs? Alongside the toolkit, the Bank is developing an Open Data Readiness Assessment Tool which provides a structured means for governments to quickly self-assess their readiness for open data. The toolkit is freely available online and feedback on the current draft is welcome. By request, the World Bank can perform a more in-depth assessment of a country's potential for Open Government Data and produce actionable recommendations. Through the Trust Fund for Statistical Capacity Building (TFSCB), there is some funding available for partnering with governments interested in conducting these assessments. Eurostat continues to improve upon and promote existing tools to support statistical capacity building in developing countries. The exploratory phase has just ended for a project to develop a tool for assessing the strengths and weaknesses of national statistical systems. The resulting "Snapshot" tool is primarily aimed at generalist Commission staff in the EU delegations, and provides key support for the analysis of a country's statistical system as a basis for designing appropriate programmes to develop it. A follow up phase will further develop the user-friendliness of the tool and add specific statistical sectors to be assessed, based on further in-country testing and consultation with potential users. The set of tools developed by Eurostat mainly serves two types of objectives and target stakeholders: Advise European Commission services, and, to a larger extent, the donor community, on the design of statistical support programmes; and assist producers in the compilation of specific statistical domains according to international standards. The Snapshot tool complements existing products developed by Eurostat, such as the Essential SNA, a practical handbook on the basics of national accounts; and a Guide to Statistics in European Commission Development Co-operation, an interactive guide to all things statistical for EU Delegations in non-EU countries. 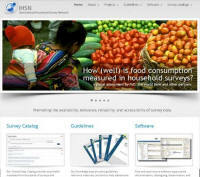 The International Household Survey Network (IHSN) and Accelerated Data Program (ADP) have just launched their new websites. Have a look to be updated on recent developments, download the tools and guidelines made available by the IHSN, and to check progress and results delivered by the ADP!